Opposite Sergio’s (a very different beast), Bonnie Gull is a place I’ve been meaning to go to for quite sometime. Fitted out like a port side piece of sunshine even on a gloomy October day it felt warm when we got in. We got there pretty much the second it opened and so briefly, very briefly, had the place to ourselves. Soon however the place was buzzing with the animated yet discreet conversation of mid-level BBC types and their (at times celeb) chums. Bread arrives while you’re perusing the menu and its a shortish but very tempting offer. We skipped sharing plates and I had a starter of smoked salmon with and horseradish. Generous smoky salmon and shards of olive oil fried bread was a very good combination while the horseradish could have been slightly more fierce to please my jaded palate. Then a main of mackerel. Not one but two fillets; perhaps they’d overheard me saying that mackerel is one of my favourite things and heaped on another one. Yum yum but I was looking enviously across the table. Definitely had chip envy. It’s a tight room but the staff get around efficiently and lunchtime flashed by in a blend of good conversation and fishy deliciousness. With football in the evening I could have indulged in dessert guilt free but thought I’d save myself for when I return in the evening, which I will do as soon as I’m allowed. The bill was pretty reasonable and the cooking a cut above most restaurants I’ve been to in this part of London. For a quick lunch we went to Percy & Founders in the (relatively) new development of Fitzroy Place. I’d had my eye on it for a while as I’ve led a couple of tours through the area, stopping off in particular to look at The One and the Many, a rather good sculpture by Peter Randall-Page. It’s a tactile thing with a strong narrative to relate and it contrasts well with the preserved nineteenth century Middlesex Hospital Chapel at the centre of the new development. If you’re in the area it’s worth a detour. So yes, the restaurant. One of its major upsides is that it has a terrace where you can dine al fresco without sucking up exhaust fumes, which is rare for this part of London. So that’s where we sat. Fellow diners were few at first as we were quite early for lunch, so it was a bit of surprise that after ordering the waiter forgot to bring our drinks – we had to ask for them again when he brought the food. The food was very good. A standard modern-British menu is reasonably priced for Fitzrovia and my bass was cooked perfectly with plenty of veg on the side. Shared chips were crunchy and fluffy and we wrapped up with a good quality espresso each. The inside (as is usual with these purpose built places) is cavernous so I’m not sure that it’s the kind of place for an intimate meal but for lunch or dinner among friends you could do worse. Post-court strolling with a friend along the river minutes after the monsoon we bumped into two friends. Happy meeting! They invited us for cocktails and we obliged (at the Oxo Tower, looking a bit shabcious compared to younger rooftop venues) before tootling along to Eat Tokyo on the recommendation of the Japanese member of our party. Eat Tokyo is unequivocally the best value I’ve ever had in Covent Garden. Occupying a few floors of an 18thC townhouse it offers your usual mixture of ramen, curry, sushi, bento and sides. The menu is voluminous so we followed our leader and went for a bento each. Bento max in fact – two boxes containing mackerel, salmon, salad, fried tofu, pickles, rice etc etc. All v good for less than a tenner. We shared some good battered stuff too. One of us had been to the Delacroix exhibiton (a must-see), the other had endured a 90 minute school presentation on university options. We were both famished and hungry for spice. Thames-side near St. Paul’s we decided to walk north. Big mistake. Between St. Paul’s and Old Street there is no Indian to be found now that London Wall is going through wholesale redevelopment. Eventually we stumbled upon Curry Leaf East near Old Street roundabout. The menu looked standard so we ducked inside and were greeted warmly. However, the only two person tables on offer were either in the middle of a row or tucked behind a pillar in a corner. We took the least worst option and went to the corner. It was an ideal location for those on the run from the law but otherwise the scraggy wallpaper and chipped plaster were rather unappealing. The food however was very good. A mixed vegetable starter was piping hot (in both senses of the word) and went down a treat. The tarka dhal was excellent as was the chicken curry. And yet, and yet. At about 35 quid per head this was by far the most expensive Indian of the year thus far. If we’d struck out East we could have had better eats at half the price and taken our own choice of booze rather taking the usual Cobra-Kingfisher challenge. For me this Pizza Express is the original and the best. I’ve been coming here for over twenty years and in a normal year I would eat here about once every couple of months. Anyone who read my review of their branch in St. Paul’s in 2013 will know that I’m an admirer of their operation. So obviously I’ve made a massive tactical mistake in using it up so early in 2016, in a central London location (as PE is a dependable option when you’re alone in a strange town), and on a one-man mission to boot! Well, not really. I was ravenously aware of the need to lay in some bait before the Fullback quiz and I had a pizza sized hole in my stomach. I used to bring my infant children to this branch after school and before I abandoned them to the Birkbeck nursery while I improved my mind. It brought genuine nostalgic warmth to my heart when I saw that the manager on duty on this evening was the same one who used to welcome us all in on cold Tuesday evenings all those years ago. Such continuity is rare in the West End. The room itself is a bit echoey but it’s in a beautiful old building that has been carefully tended over the years. You get a mixture of regular locals like me and tourists like the big family at the round table in the centre of the room. It feels homely. The pizza, as ever, was just right and washed down with a slug of Chianti made me a very contented man. I strolled off to contribute to a narrow win. A good day. 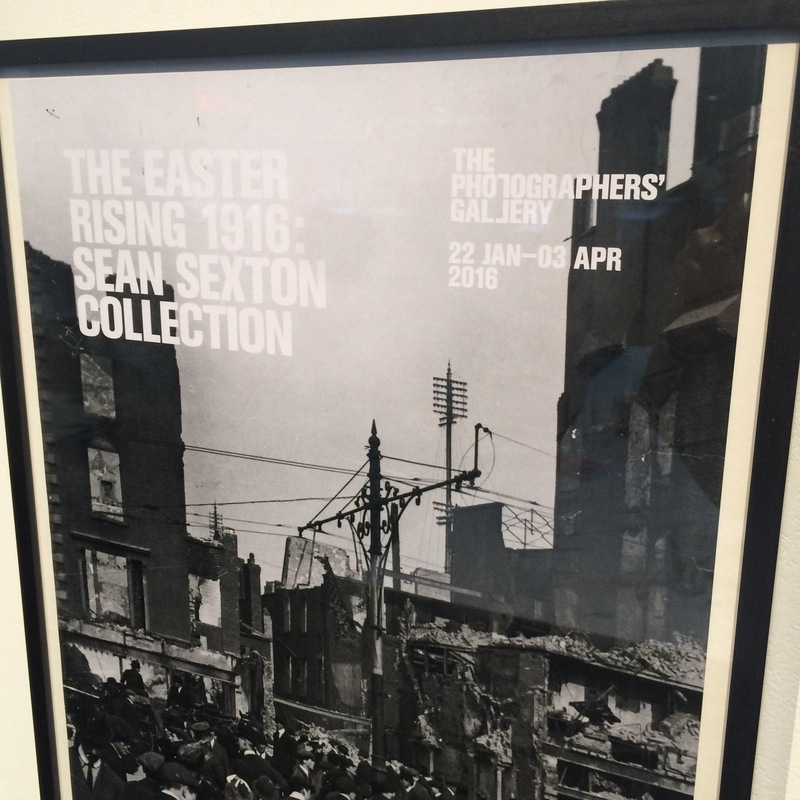 Fresh from two hours of document analysis with the students of the University of Westminster I was absolutely in the mood for the kind of exhibition that ‘Easter Rising 1916’ at the Photographers’ Gallery purports to be, especially as I’ve got an upcoming seminar to teach on British stereotypes of Irishmen in the nineteenth century. Looking on the website I found some good introductory blurb which promised an exploration of the complex events of the Irish revolution through documentary photographs, propaganda images and personal memorabilia. The promise wasn’t kept. Sure enough the documents presented are complex enough. A standout object was a complex collage of images juxtaposing a photograph of John Wilkes Booth (the assassin of Abraham Lincoln) with pictures of Irish nationalists and a derogatory cartoon depiction of simian Fenians. You could write a decent essay on such a document. That is if you were told (among other things) who had assembled it, where the pictures and images that made it came from and to whom it was distributed, if it was distributed at all. There was no contextual information at all. Some explanations were given of the political and social context for the Easter Rising (and its political aftermath) but not enough. Even for a historian who has written (marginally) about the politics of the period there was not enough information on the images to really let me know exactly what was going on in a particular shot. There were a lot of pictures of Men in Uniforms but too often no information as to whose uniforms they were wearing. And the occasional laconically expressed moral judgement reminded me of the Empire exhibition at Tate Britain in that it showed the modern taste for self-righteous condemnation of a group of people of whose lives and motivations the commentator has a limited historical grasp. Worse, it made no effort to make life easy for the non-specialist, for someone who may be interested in the events of the time but who hasn’t made a life’s work of knowing about Collins, French, Parnell or Markiewicz. To take one example, a picture is shown of Michael Redmond reviewing troops in 1915. A student of history would know who Redmond was and why his reviewing of troops heading to the Western Front (if that’s where they were going – we’re not actually told) would be a controversial action for a significant section of the nationalist public. Unfortunately for non-historians none of that is explained. Redmond doesn’t even feature in the historical account of the period that appears on the PG website or in the information panels on the walls and in the picture he is one of five or so men on a platform above the troops. So if you weren’t familiar with who he was before you got to the exhibition (physically or politically) you still would be none the wiser once you get there even though you were staring at a photograph with him in it. So this is an exhibition that if it were in Dublin would be forgivably light on context. But for a London audience it needed a lot more work. And ideally an Irish historian on board, I can’t imagine that Diarmaid Ferriter or someone of his ilk would have turned down the opportunity. After a morning of snooker myself and the youngest child were ravenous. Fortunately Bun&Bar is located just across the road from the Empire of Baize and I was in the mood for a burger. B&B claim to make the best burgers in Harringay and since my only other burger-munching takes place in the McDo down the road I wasn’t expecting them to fail on that score. They didn’t. My burger was cooked to perfection, a good juicy lump of meat in a brioche bun and plenty of flavour. Rosemary salted fries on the side went down well and they have an impressive selection of beers on draft or in bottles. Custom was brisk on a Saturday lunchtime and it’s not difficult to understand why. With a friendly welcome and good food at a reasonable price Bun&Bar can easily compete with the myriad kebab restaurants if you need a meaty fix on Green Lanes. I’m tempted to invoke the Nando’s Escape Clause* to be able to return for a snooker-burger one-two but I’ll try and resist so that I can try out more new options in Harringay. *For the purposes of these reviews I define a restaurant as somewhere where the server brings you the bill at the end of the meal. Meaning that places where one pays up front (like Nando’s and Bun&Bar) can technically be visited on more than one occasion according to the rules of 2016. Tucked away between Jermyn Street and St. James’s Square the White Cube Gallery is not the easiest to stumble across in London. You have to know it’s there to go there. As it happens to be next to the library I try and pop in whenever they have a new show but have been rather neglectful of late. Fortunately it started raining as soon as I got out of the door yesterday and rather than ducking back inside to the books I stepped in to the white stark of the Cube instead. Inside they are currently showing the work of Park Seo-Bo, an artist of whom I knew precisely nothing before yesterday. He was a revelation. Minimilism is his thing; his technique involves painting a canvas white then making regular marks in pencil in the paint in a single sitting before it has had time to dry. The finished product is reminiscent of the American Abstract Expressionists while being wholly original. To get an idea of the beauty of Park’s canvases you really have to see them in the flesh. Like Frank Auerbach (currently on show at Tate Britain – highly recommended if you haven’t been) a photograph can’t render the texture of the paintings – a texture that varies from work to work – the paint thicker or less evenly applied, some areas of the canvas left bare, and the looseness or tightness of the pencil marks creating entirely different moods. In fact the gesture of the pencil marks in the paint reminded me of music. While Park calls them Ecritures numbered individually one might equally describe them in musical terms such as legato or agitato. In the handout it is said that Park is interested in reaching a sense of ‘pure emptiness’ to whose effect his use of white – ‘a signifier of immateriality’ – is fundamental. For myself, I find that the best abstract paintings create a blankness, a space in which the mind can wander which it then fills with attempts to cohere the abstraction into something more meaningful, if only as a sensual experience. Park’s work to me seems entirely about nature. For example one of them, whose lower quarter was rough with unprimed canvas, was suggestive to me of a landscape with a horizon supporting sparse arabesques that might be clouds or lights in the sky. My favourite is on the left in the photograph below. In this shot it looks rather anodyne but when you’re sitting in front of it it buzzes and hums with rhythm and energy, like a tidal pattern on a shallow beach. I can’t recommend this show highly enough for 30 minutes of contemplation away from the sales, the noise and the rain in the West End. The receptionist was friendly and the gallery is free to visit.